In recent years, the glaring spotlight of skepticism has been turned to the topic of vaccines, bitterly dividing parents and giving doctors of modern medicine conniption fits — but no matter where you stand on vaccinations, the fact two groundbreaking, scientific, peer-reviewed studies painting inoculations in not-so favorable light have vanished from the Internet is cause for concern. Originally, the study, titled, “Pilot comparative study on the health of vaccinated and unvaccinated 6- to 12- year old U.S. children,” was published in Open Access Text. Until, that is, Open Access Text removed it and a second, similar study by the same authors from their archives without explanation. In fact, The Free Thought Project attempted to contact Open Access Text on multiple occasions for an explanation on the abrupt decision to pull the studies — but, as of publishing, had yet to receive a response. Although that sheds no light on the motivation for OAT to pull the study, it provides added evidence studies running counter to the long-held assumption vaccinations should not be questioned are far more frequently so explosive, the ensuing controversy and rush by modern medicine — often backed by the pharmaceutical industry — to denigrate such results is powerful and swift. Mawson and his team of researchers included nine charts and a full 71 references in their comparison of the long-term health prospects between vaccinated children attending public schools and their unvaccinated, homeschooled peers, to determine what results from the current scheduling of vaccines that could, perhaps, be overlooked under the general assumption of vaccine safety. “Assessment of the long-term effects of the vaccination schedule on morbidity and mortality has been limited,” the study stated, with paragraphs artificially inserted for clarity. 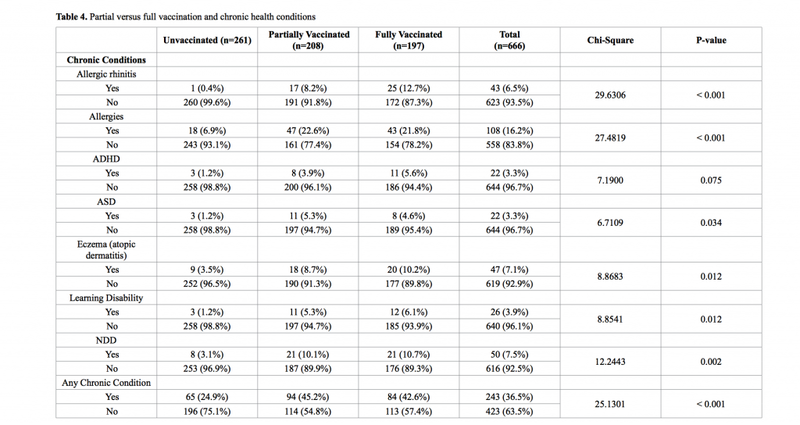 “In this pilot study of vaccinated and unvaccinated homeschool children, reduced odds of chickenpox and whooping cough were found among the vaccinated, as expected, but unexpectedly increased odds were found for many other physician-diagnosed conditions. “Although the cross-sectional design of the study limits causal interpretation, the strength and consistency of the findings, the apparent ‘dose-response’ relationship between vaccination status and several forms of chronic illness, and the significant association between vaccination and NDDs [Neurodevelopmental disorders] all support the possibility that some aspect of the current vaccination program could be contributing to risks of childhood morbidity. “Vaccination also remained significantly associated with NDD after controlling for other factors, whereas preterm birth, long considered a major risk factor for NDD, was not associated with NDD after controlling for the interaction between preterm birth and vaccination. “In addition, preterm birth coupled with vaccination was associated with an apparent synergistic increase in the odds of NDD above that of vaccination alone. Nevertheless, the study findings should be interpreted with caution. Mawson and his team found vaccinated children significantly more likely their unvaccinated counterparts to be prone to allergic rhinitis (hay fever) [10.4% versus 0.4%], other allergies [22.2% vs. 6.9%], eczema/atopic dermatitis [9.5% vs. 3.6%], a learning disability [5.7% vs. 1.2%], ADHD (attention deficit hyperactivity disorder) [4.7% vs. 1.0%], ASD (autism spectrum disorder) [4.7% vs. 1.0%], any neurodevelopmental disorder (learning disability, ADHD, ASD) [10.5% vs. 3.1%], and “any chronic illness” [44.0% vs. 25.0%]. Children receiving only part of the full vaccination schedule had a mixed resultant development of these afflictions. 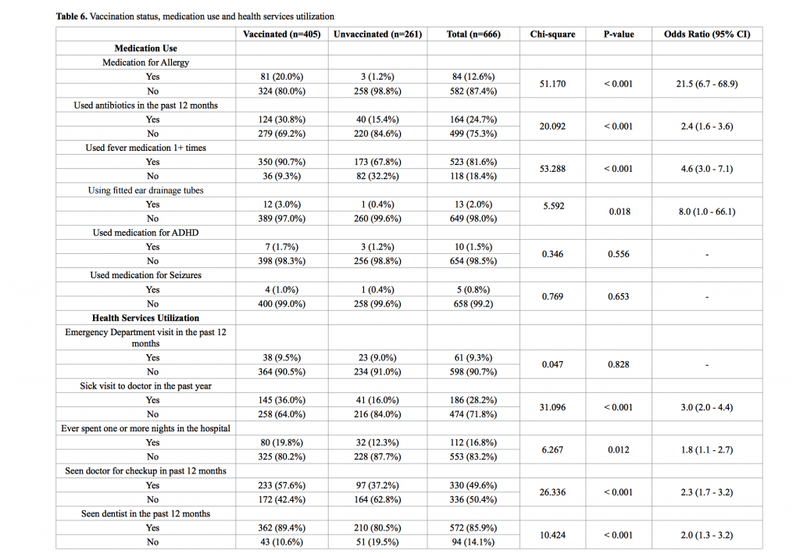 “The second aim of the paper focused on a specific health outcome and sought to determine whether vaccination remained associated with neurodevelopmental disorders (NDD) after controlling for other measured factors. After adjustment, the factors that remained significantly associated with NDD were vaccination, nonwhite race, male gender, and preterm birth. The apparently strong association between both vaccination and preterm birth and NDD suggested the possibility of an interaction between these factors. This was shown in a final adjusted model with interaction (controlling for the interaction of preterm birth with vaccination). 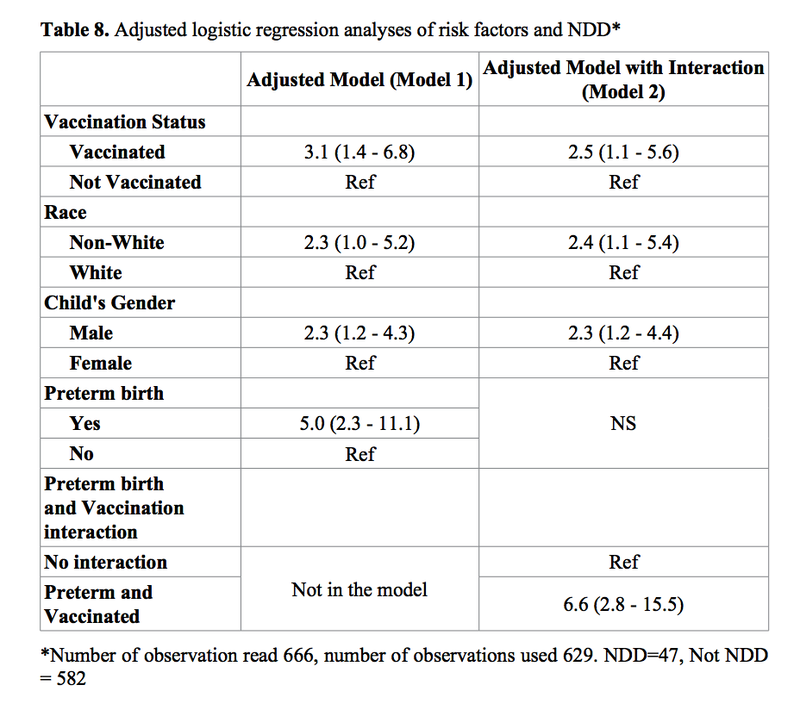 In this model, vaccination, nonwhite race and male gender remained associated with NDD, whereas preterm birth itself was no longer associated with NDD. 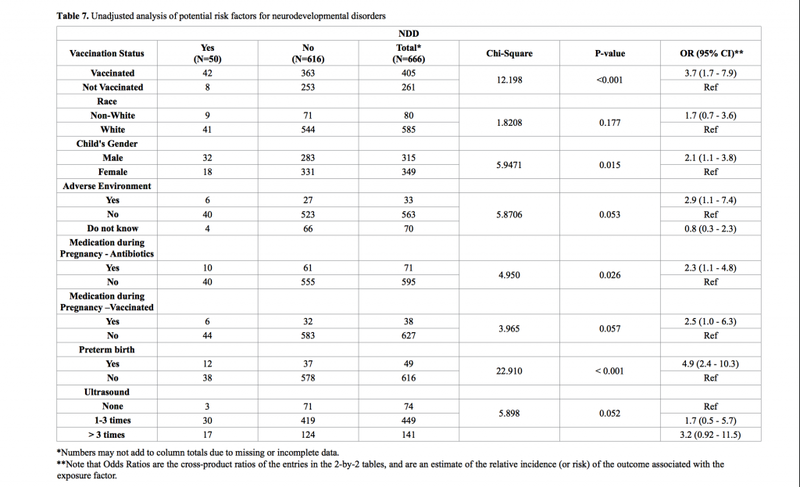 However, preterm birth combined with vaccination was associated with a 6.6-fold increased odds of NDD. Obviously, these results were unexpected — and call to task the increased number of vaccines highly recommended, and in some instances required, by the medical community. “A possible contributory role for vaccines in the rise in NDD diagnoses remains unknown because data on the health outcomes of vaccinated and unvaccinated children are lacking. The need for such studies is suggested by the fact that the Vaccine Injury Compensation Program has paid $3.2 billion in compensation for vaccine injury since its creation in 1986. While the Mawson study immediately found detractors — many of whom questioned the results and method of inquiry — the preceding paragraph shows the researchers not glibly intent to prove vaccinations responsible for the astronomical rise in diagnoses of autism. This was not intent to prove the movie Vaxxed correct. 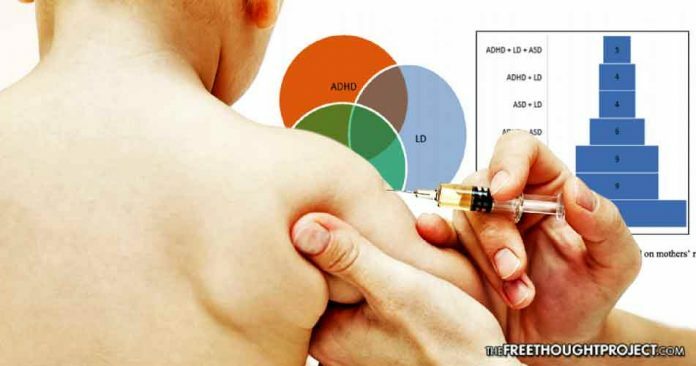 In fact, while the most common concern and complaint among those who question whether or not their children should receive so many vaccines surrounds possible connections to autism spectrum disorder, the author clearly states any correlation or link has not been substantiated. Incidentally, this isn’t the first time this study has been pulled from the Internet: the same thing happened last year, under similar circumstances — i.e., furious backlash on methodology and sampling — but, notably, not for the results. While detractors could indeed dissect some flaws in the Mawson team’s analysis, the astonishing differences between the inoculated and unvaccinated populations should at minimum prove resoundingly the imperative for further study. Vaccinations, as Mawon clearly states, have performed miracles by eliminating some of the most pernicious diseases and afflictions humans have faced — but the categorical increase in the number of vaccines physicians recommend, coupled with the dearth in studies of potential reactions among them, make the oblivious rush to inoculate children and adolescents against as many as possible seems foolhardy, at best. Vaccinating children remains the guardianship decision of parents, but truly informed consent only comes with comprehensive research, evaluation, and study of every conceivable outcome — both positive and negative. These substances cannot be removed from a human body once injected. Deciding whether to fully or partially vaccinate — or to abstain, altogether — should not be blindly undertaken because the majority of the medical community deems it so. Science has brought innovation, advancement, and betterment of health unimaginable a century or two ago — but science isn’t perfect. It was science, after all, which once deemed the Earth a flat disc, around which the Universe spun. Yes, we should indeed turn to those with greater knowledge and education on a subject than ourselves to make an informed decision on any medical procedure — but it would behoove us all to understand new information can dramatically change the field of medicine. With that in mind — and with the deletion of yet another controversial study questioning the dominant vaccine paradigm — the choice to vaccinate your children is yours.